Dr. George Rudawsky has been practicing veterinary medicine in the northwest suburbs since graduating from the University Of Illinois College Of Veterinary Medicine. Veterinary medicine has been a bit of a family tradition in the Rudawsky household as his father, aunt, and cousin have all been practicing veterinarians. He was raised in Des Plaines, and attended Maine West High School before going to Northwestern University for his undergraduate studies. He attended the University of Illinois for his graduate work in veterinary medical sciences, and graduated from the College of Veterinary Medicine in 1980. When not in the office, he enjoys woodworking and restoring automobiles and other mechanical devices. He and his wife, Julie, have two children and a very spoiled Labrador Retriever. Dr. Brian Courtney grew up in Oak Park, IL. When he was 15 he began working at a local boarding kennel, from then on he was hooked into the pet care business. He graduated from the University of Illinois in 1985 with a bachelor’s in Biology and liked Champaign Urbana so much he went back for 4 more years of study at the College of Veterinary Medicine at the University of Illinois, receiving his Doctor of Veterinary Medicine in 1990. Besides working for the Northwest Animal Hospital for 20 years, Dr Courtney has a companion animal house call practice. In the 5 minutes per day that he is not working he enjoys spending time with his wife, Linda, his 3 children and his menagerie of pets including Bradley, the worlds greatest dog. He also enjoys playing his guitar (badly). Dr. Roberta Drell graduated with honors from the University of Illinois Veterinary College in 1982. In 1987 she became one of the first women veterinary practice owners in the area when she purchased Morton Grove Animal Hospital. She owned Morton Grove Animal Hospital from 1987 until 2008. Imagine her surprise to find herself still happily working part time at Northwest Animal Hospital. She shares her home with Cinco the chorkie, Kitty Khatenga the wonder cat, 6 finches and her husband Jeff. In her spare time she loves to travel the world and to experiment with photography and cooking. Dr. Liz Orsi grew up in Franklin Park, IL and knew she wanted to be a veterinarian by the time she was six years old. She started working at a veterinary clinic when she was a teenager and she graduated from the University of Illinois, College of Veterinary Medicine in 2006. She moved to Arizona in 2006 to be closer to her family but the hot summers proved to be too much and she returned to the Chicagoland area in 2007. She still visits her family often and attends Cubs Spring Training games whenever possible. Dr. Orsi is extremely passionate about proper pet nutrition and client education. She has had extensive animal nutrition training and works to dispel common nutritional misconceptions. She currently lives in Elgin with her orange cat, Sam. Dr. Sullivan grew up in north suburban Libertyville, IL. At age 10 he began assisting his oldest brother, Ed, a veterinarian much his senior. There began his long journey to a veterinary degree from the University of Illinois in 1983. Dr. Sullivan eventually bought his brother’s practice, The Mundelein Animal Hospital in 1986. He thoroughly enjoyed practicing there for 35 years, semi retiring in 2016. 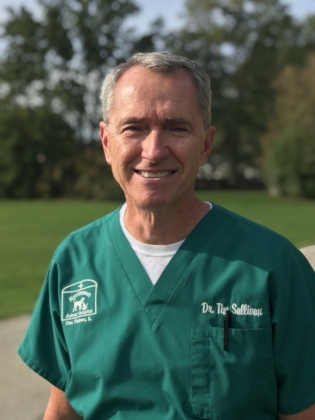 Dr. Sullivan has been working part time at Northwest Animal Hospital since September 2016. He has very much enjoyed getting to know the clients and their pets! Dr. Sullivan’s family includes his partner Mike, beagles 18 year old, Emma, and 10 year old ,Charlie, as well as 4 year old kitty, Calvin.